Contrary to popular belief, there is no “ideal“ running form across a population. Everyone has a different structural makeup and different goals, necessitating an in-depth running assessment and treatment plan to match your needs. Every new RunLab patient with weight-bearing ability begins with a full-body gait (running or walking) analysis in addition to a detailed static, functional and orthopedic exam prior to formulating a plan. Full-body gait analysis not only helps our team determine your strengths and limiters, but it also serves as a useful feedback tool to help you understand your own movement mechanics so we can work together to fine tune your individual running technique. 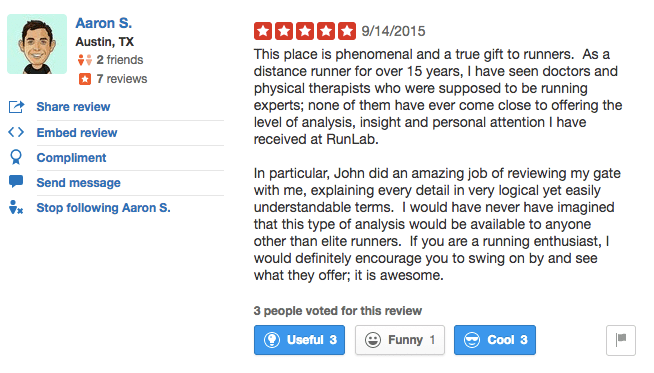 Whether you are an elite runner looking to shave time, a new runner wanting help with technique, or the parent of a kid who “looks funny” when he runs, we are the right place for you. Our team of gait specialists has extensive training in clinical biomechanics and will work with you on your running technique through focus on improved economy, performance development and injury prevention. We have worked with thousands of runners spanning every age and ability level, from Olympian, junior Olympian and professional to those lacing up their first pair of running shoes. We also work collaboratively with many types of health care providers, coaches, and trainers, so if we aren’t the right team for you we’ll know where to send you. HEALTHCARE PRACTITIONERS, COACHES, AND TRAINERS: Don’t have the time, space, expensive equipment, or detailed biomechanics knowledge to perform gait evaluation on your patients or clients but you know they need it? Let us help! We will walk you through the filming process, analyze your patient’s mechanics, and provide you with a detailed diagnostic report containing suggested strength, gait, and shoe modifications so you can do the fun part…fix them! Call 512-266-1000 ext 4 for information. Whether you are just starting to run or are trying to hit your next PR, our team will help identify limiters in efficiency that may be holding you back. It doesn’t matter how fast you can run if you end up sitting on the sideline with an injury. For this reason, we put a strong emphasis on injury prevention when assessing mechanical load in all of our runners. We have worked with thousands of runners, including those as young as 6 and as experienced as 80. We have successfully worked with a wide spectrum of athletes, from recreational to Olympic hopeful and have years of experience working with both kids and adults from every conceivable running background. We are passionate about helping runners help themselves and feel an important part of the training process should be centered around education and working with you to understand your individual strengths and limiters.